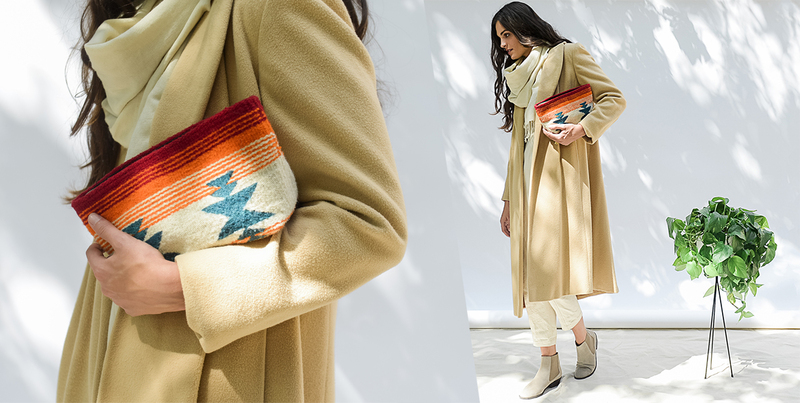 Manos Zapotecas is a fair trade fashion brand for the conscious consumer, working with artisans in Teotitlán del Valle, a Zapotec village on the outskirts of Oaxaca City, Mexico. The brand began about three and a half years ago when founder, Shelley Tennyson, saw an opportunity to bring new markets to skilled weavers on the verge of abandoning their craft for more lucrative livelihoods. 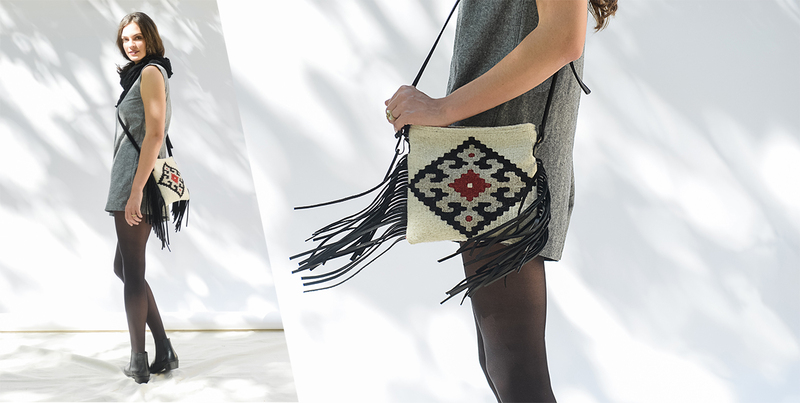 Today, the growing number of artisans of Manos Zapotecas produce an exquisite line of handmade clutches, purses, totes, and even luggage for retailers throughout the United States and online. Their latest Fall/Winter Equinox collection is eye-catching with intricate woven traditional designs and rich dyed wools in burgundy and red-oranges, a perfect complement to the turning of the season and a true testament to the teamwork and coordination that goes into a seasonal line. No matter the season or the collection, all of the Manos Zapotecas products bear traditional Zapotec designs whose origins date back as far as 500 B.C. and can be found in the fretwork and stone of the Aztec ruins throughout Teotitlán. Each symbol carries with it a fabled significance passed down with the craft and often connected to ancient Zapotec gods, beliefs, and pastimes. Many of the artisans learned how to weave by loom from their mother or father at a young age, some carding their first wool as early as 6-years-old. The art is both men’s and women’s work but it wasn’t always that way. With the introduction of the bi-pedal loom in the 1500’s by the Spanish, the men took over the weaving when they previously played no role and the women diverted to the carding, dying, and spinning of the wool. Today, the scales have shifted once more with a majority of Manos Zapotecas’ weavers being women. 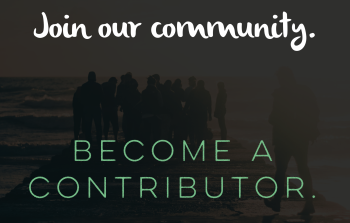 The company often profiles one of their artisans in a blog post and features her work on a dedicated page of their website, making it effortless to feel connected to the brand and the artisans behind the exquisite products. 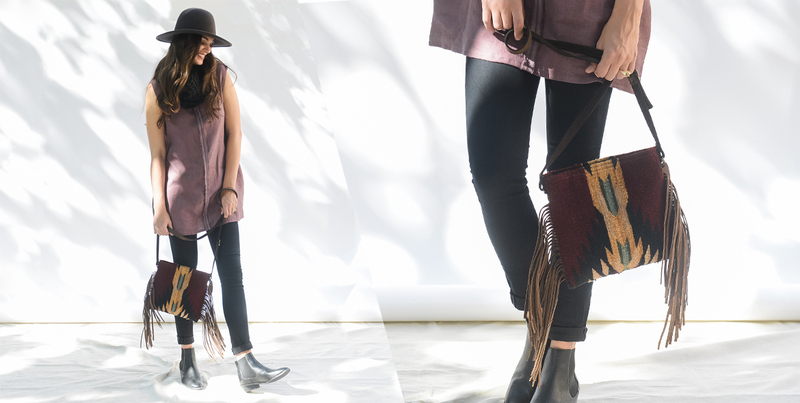 Every bag is made of 100% wool, is hand-spun, hand-dyed and hand-woven and every artisan receives a fair wage for his or her handiwork, true to the fair trade principles. In fact, Manos Zapotecas has allowed Teotitlán’s artisans to not only continue their endangered craft and life’s passion, but to earn enough to send their children to college and keep their families well-fed. Indirectly, the small-scale, hand-made nature of the operation means the impact on the environment is minimal. Any way you look at it, Manos Zapotecas has brought sustainability to the community of Teotitlán. 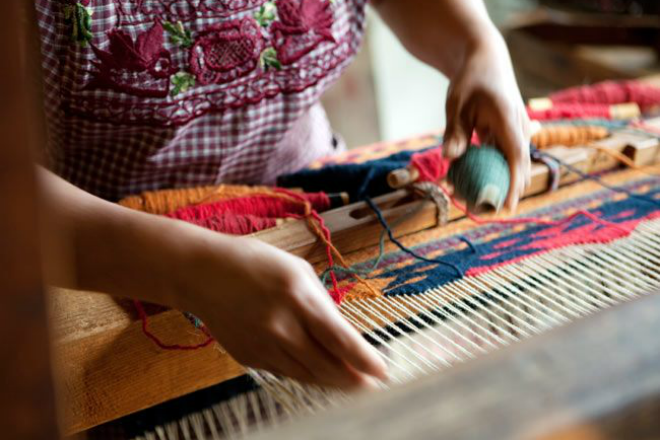 Manos Zapotecas began with the mission to connect the artisans of Teotitlán to socially conscious consumers as a way to both breathe new life into a dying craft and to bring a sustainable livelihood to a small community facing saturated markets and declining tourism dollars. 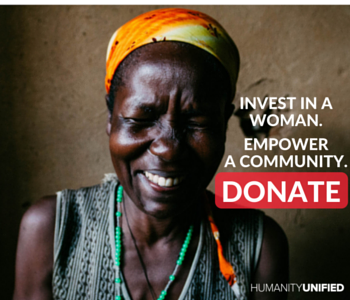 They are committed to ensuring the weavers receive a fair trade price for their stunning handiwork and labor of love that goes into every piece. 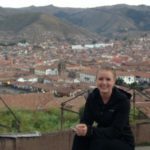 Shelley Tennyson found her way to the ancient village of Teotitlán de Valle through the microfinance nonprofit, Fundacion En Via, where she served as a volunteer teaching money management and business development courses to the locals. She found that no one really had any money to manage but that they were producing some of the most beautiful textiles she’d yet seen. Worse yet, the artisans were facing the hard decision of whether to abandon their craft for work that could actually support their family and children’s futures. The spark of an idea that became Manos Zapotecas developed and Shelley began to bring these textiles to new markets back in the States. 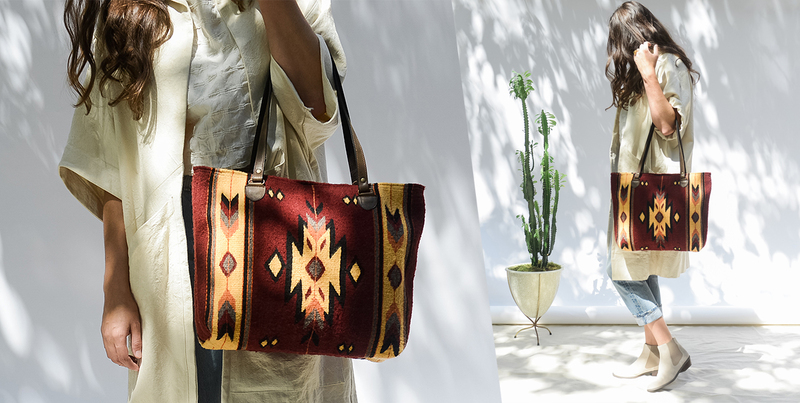 What began with just a few artisans producing handbags, pillow covers, and rugs has transformed into something much bigger and has positively impacted the entire community of Teotitlán. Glad you enjoyed the article and found it useful for your readers. Thanks for sharing!